NETWORK UPDATE: As expected, football adjustment took some of the wind out of CBS’s morning sails, but not for THE BIG BANG THEORY, which held its full 4.1 rating. As for the rest: LIFE IN PIECES lost 0.3, MOM and ELEMENTARY fell 0.2, and 2 BROKE GIRLS was down 0.1. There were no other changes, but we mistakenly had the IHEARTRADIO JINGLE BALL as running 2 hours last night, when it was only 90 minutes. It had the 0.4 rating we reported, and was followed by an episode of WHOSE LINE IS IT ANYWAY at 0.3. CABLE HIGHLIGHTS: NFL Network’s THURSDAY NIGHT FOOTBALL led Thursday cable at 2.00, although that was down 0.93 from last week’s game. TNT’s NBA doubleheader made this a sports heavy night, with the games at 0.91 (Oklahoma City vs Cleveland) and 0.70 (Houston vs. Lakers). Syfy followed with WWE at 0.64, which had as its lead-out the final two episodes of HAVEN at 0.21/0.12, compared to 0.21 for last week’s single episode. On A&E, NIGHTWATCH was up 0.11 to 0.55, and THE FIRST 48 gained 0.03 to 0.50. HGTV’s FLIP OR FLOP climbed 0.04 to 0.46, and then TINY HOUSE HUNTERS was at 0.39. 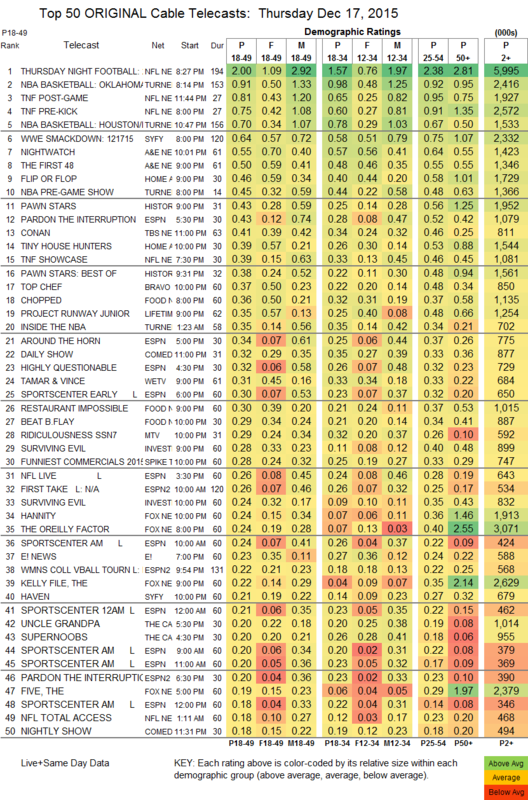 On History, a PAWN STARS at 0.43 was followed by a clip show at 0.38, compared to twin 0.35s last week. Bravo’s TOP CHEF was steady at 0.37, and Lifetime’s PROJECT RUNWAY JR was equally steady at 0.35. 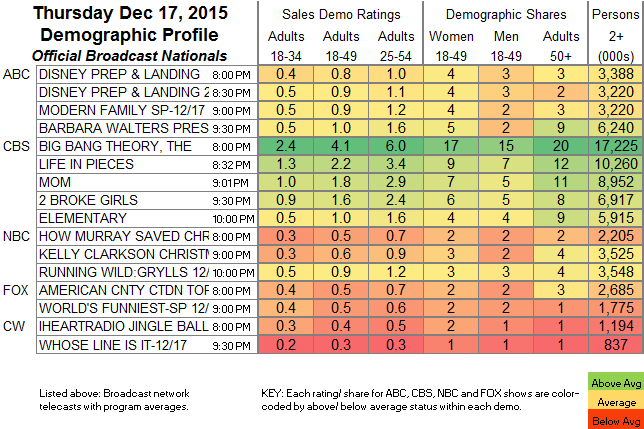 Also steady: MTV’s RIDICULOUSNESS at 0.29, but BROKE A$$ GAME SHOW fell 0.02 to 0.12. A FUNNIEST COMMERCIALS OF 2015 special on Spike was at 0.28. Despite the star power of Idris Elba and strong reviews, BBCAmerica’s LUTHER was at 0.05.